Coventry – Coventry University Dodgeball team has been suspended from Coventry University Students’ Union after members were pictured wearing t-shirts with swastikas and antisemitic messages on them. The two members of the Dodgeball team were pictured wearing white t-shirts with phrases and pictures drawn on them at Empire on Wednesday. Messages such as “Judas is a sell out”, and “the Jews deserved it” were written on their tops. The photos were posted on Empire’s Facebook page and later reported to the University by the president of the Jewish Society. The team has since announced on their Facebook page that “due to unforeseen circumstances,” all socials and training have been cancelled “until further notice”. 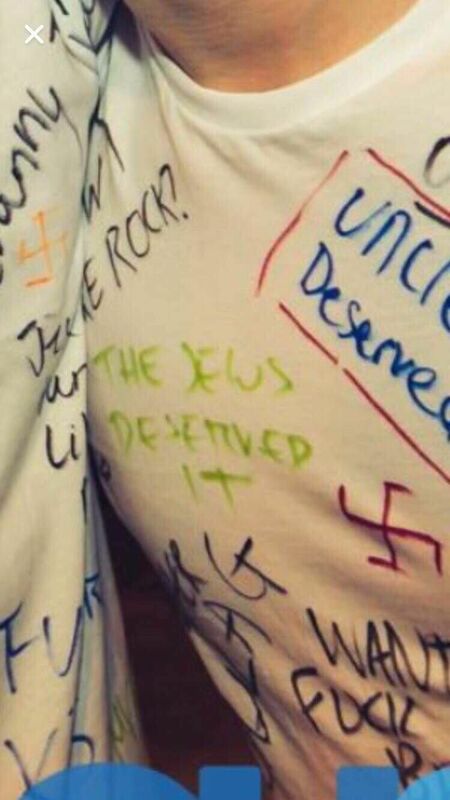 Union of Jewish Students (UJS) said: “We are once again dismayed to see another incident of antisemitic language written on t-shirts at a student party. “This academic year we have already seen antisemitic incidents at ‘white-T-shirt parties’ in Plymouth, Lancaster and Newcastle, all revolving around the Holocaust. Tochukwu Ajare, president of Coventry University Student Union, said in a statement: “We understand these pictures were taken during a social event at a CUSU affiliated sports club. We were made aware of images on social media of two of our students wearing t-shirts with anti-semitic and other offensive imagery and writing on them. We understand these pictures were taken during a social event for a CUSU affiliated sports club. We have immediately suspended the club while we look into the matter. We do not tolerate anti-semitism or any form of hate crime. We will fully support the university in any disciplinary action it may take.